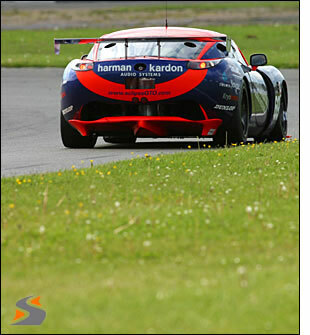 This was a truly fantastic race and an equally fantastic result for Eclipse Motorsport. A first overall race win for the team in the British GT championship brought with it not only the glory of the top step of the podium but the historic British Empire Trophy too. Round 5 would be the longest ever race in the British GT Championship, a three hour marathon over the Silverstone Grand Prix circuit. Ben McLoughlin was in attendance too, ready to support the cause. 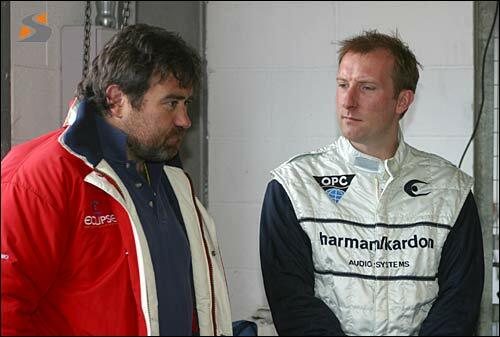 Tactics were going to play a significant part in this race....Chris Pollard and Piers Johnson, below. 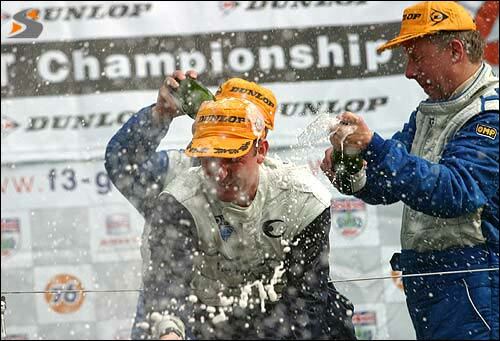 2002 British GT champion Ian McKellar led the field around in the SEAT pace car as Piers Johnson prepared to do battle with the Moslers ahead. But Piers was ‘jumped’ by the Xero Racing Corvette at Becketts, and would have to deal with three big Yank V8s if he was to take this one. Peter Le Bas in the Corvette was pushing very, very hard to try to stay with the flying Moslers and Piers was sensibly biding his time. At the head of the race Tom Herridge was storming away, an indication that strategy was at play. With this in mind the issue of getting by the Corvette was becoming more urgent: Herridge was more than four seconds ahead of the second Mosler at the start of lap 2, but Piers was now in a position to challenge Le Bas for third. A chance presented itself around the outside of the tricky Club corner but Le Bas got a little sideways and the Eclipse man – perhaps mindful of how far they would have to race today - decided discretion was the better part of valour. He kept his momentum though and by the time the pair reached Abbey curve, Piers had grabbed third. The fight for the place wasn’t over yet though. As Piers reeled in Jamie Derbyshire’s Mosler, Steven Brady in the fast improving Ultima had blown by the Corvette and was in turn closing down on the Eclipse T400R. 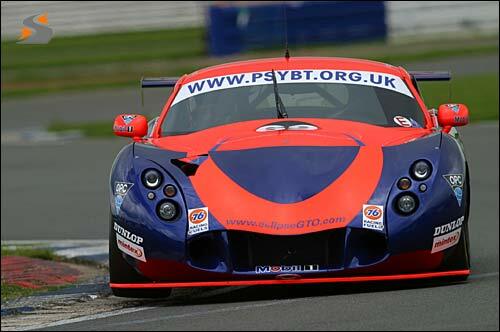 It was a five car train now, with Steve Hyde in the CDL TVR also joining in the fun – incredibly it was just six minutes into a three hour race, and so much seemed to have happened already. First to make a move was Brady: he edged past the Eclipse car for third. 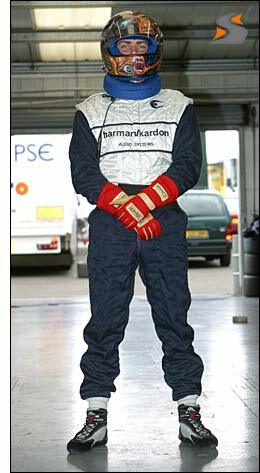 Perhaps that was the spur that Piers needed, taking the place next time around and then hustling up the inside of Derbyshire at Woodcote for second place. With Tom Herridge now almost 10 seconds up the road it was time to get really moving. The lead began to shrink. Pressure from behind was relieved as the Corvette and the Balfe Motorsport Mosler clashed, the Corvette out on the spot and the Mosler hobbling round to the pits. With 30 minutes gone Piers was eight seconds adrift of the Mosler but steadily nibbling at the difference, a cracking lap of 1:57.190 chewing another few tenths away. Through the traffic, the orange TVR seemed to take the bolder approach. The Mosler was getting large in Piers’ sights as the hour mark approached, with the difference just two seconds when a Porsche stranded in a dangerous position called for the pace car to be deployed. Two seconds now became two tenths! 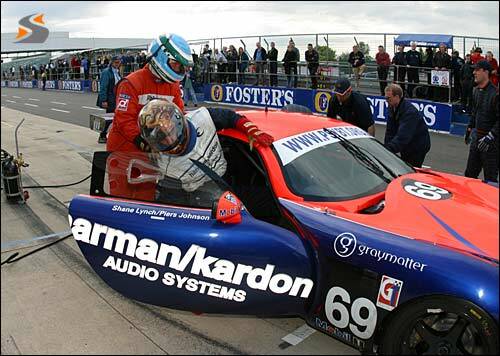 The lead car pitted for fuel, tyres and a driver change to factory TVR man Rob Barff. Piers stayed out, took the lead of the race and the gameplan for Eclipse was now becoming clear: stay out until half distance and make the race distance on one fuel stop. Could they? The Porsche having been recovered, the pace car withdrew and Piers was back into his stride immediately, with laps in the low 1:57s, Barff now almost two minutes behind the leader and in fourth place. Barff was clearly the major threat but there was trouble in store for the #22 Mosler. It slowed dramatically as it passed the pits, and #69 immediately pounced to lap the Rollcentre car and Barff was left to complete a slow lap, the entire gear linkage having come adrift. This was looking good – for Eclipse! Eventually, with 86 minutes to run, the orange Tuscan pitted, the last of the major runners to do so. Fuel, a driver change to Shane Lynch (ready to go, right), and tyres too, were the order of the day, at least that was the theory. A stumble from someone in pitlane saw the air bottle to power the wheel hammers discharged. Team manager John Griffiths made the call for the car to get on its way, rather than risk the delay of finding a replacement bottle: Shane duly rejoined the race, enough fuel on board to finish the race, but with tyres that were definitely past their best. Could this be Eclipse’s undoing? Rob Barff was now, incredibly, getting to grips with a car with just one gear (fourth). He was lapping quickest of all! He would unlap himself from the Eclipse car and would climb to second overall before making a final pitstop for fuel with just 26 minutes of the race remaining, dropping the car to fourth. 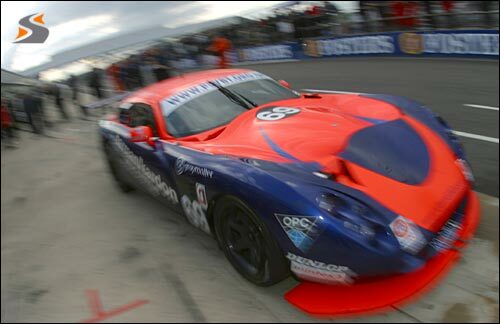 It was looking ever more like a TVR 1-2-3, but in what order? With just over 20 minutes and the Eclipse car’s lead a healthy 105 seconds, Shane pitted, those tyres now completely shot – a fantastic achievement from Dunlop though, to run for over two and a half hours at fierce racing speeds. Ben howled out for the last 20 minutes and emerged back into the fray just a handful of seconds ahead of John Hartshorne. That wasn’t all though. Steve Hyde had received the “Hurry Up” board from CDL boss Bert Taylor and was pushing hard too, in an attempt to relieve Hartshorne of his second slot. 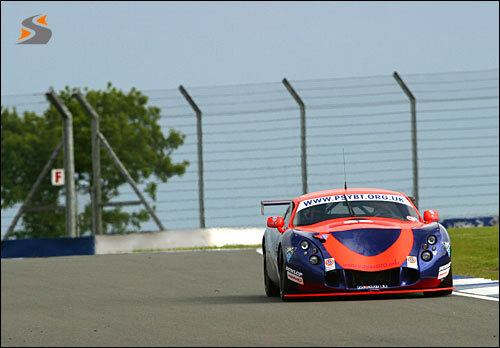 Ben seemed to have Hartshorne’s measure, first allowing the Peninsula TVR backed car to come within 4.3 seconds, then imposing his authority on the race. 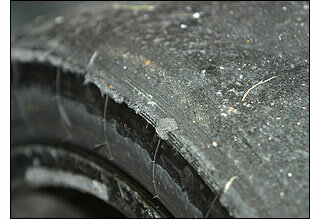 As the minutes ticked down it was a question of fuel, did the TVRs have enough? The short answer was yes they did. It was a race to the flag though, with Ben controlling it from the front in the closing stages, finishing just 2.1 seconds clear of John Hartshorne with the charging Steve Hyde still 11 seconds further back. A TVR 1-2-3. As the champagne flowed, the Eclipse squad seemed almost stunned by the success. It was clearly a popular win, with the whole paddock turning out to applaud the team’s win. That desperately disappointing day at Knockhill last year is history now. So it is the tremendous trio of Johnson, Lynch and McLoughlin that will find their names engraved on one of British motorsport’s most historic trophies. In the Championship, Piers and Shane have closed the gap to the Mosler crews ahead, with just a handful of points the difference between Herridge in second spot and the Eclipse boys in third – a good result in the next round at Castle Combe could really shake things up. There’s a few weeks to savour this win though. Marvellous stuff!